February 4, 2019 information on services, News. 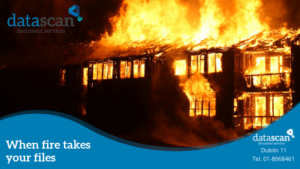 Despite all best efforts to have health and safety measures in place, a fire can start at any time in an office or warehouse. In the past few months there have been some widely reported fires that have affected many businesses quite seriously. Last September, a fire broke out during the daytime that affected several small businesses in a building in Coolock. Thankfully all the staff were fine but with smoke damage being extensive throughout, much damage was to be expected. A bank in the city centre suffered damage as a result of a fire in December. Even the first week back to work this January brought news of a substantial fire, this time in Bray. In this fire, a solicitor’s office was badly affected along with other buildings nearby. While insurance will cover much of the cost in getting back up and running, the worry centres around those items that cannot be replaced. In particular, the information you hold in paper documents is very susceptible to damage or destruction in the event of a fire. Once those paper files are gone, then you can’t get them back. This will have a major impact on any business but for financial or legal businesses, this could cause complications for clients for years to come. The reputation of the business may be affected and this in turn could have huge implications for future success. Sometimes the clever solutions are the ones that are the simplest. Having your paper files scanned and stored securely in the cloud is the way to ensure you are not at risk should a fire break out. Start your journey today, assemble all your information ready for collection and get in contact. Our team will collect it from your premises, scan it in our secure location and deliver it back to you in digital format. Then it will be ready to upload to your management system or to store securely in the cloud. 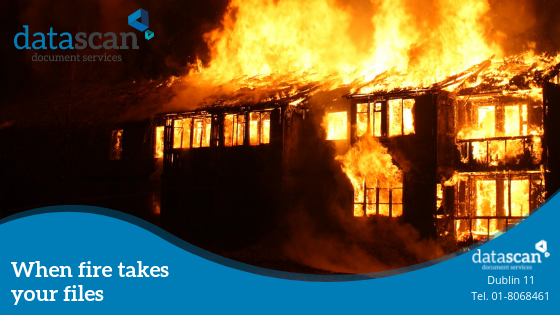 Protect your data from the threat of fire today, don’t leave it too late.